To say that the iPhone 4S has been well received on Sprint and AT&T is a bit of an understatement, as it set opening day sales and activation records for both carriers. 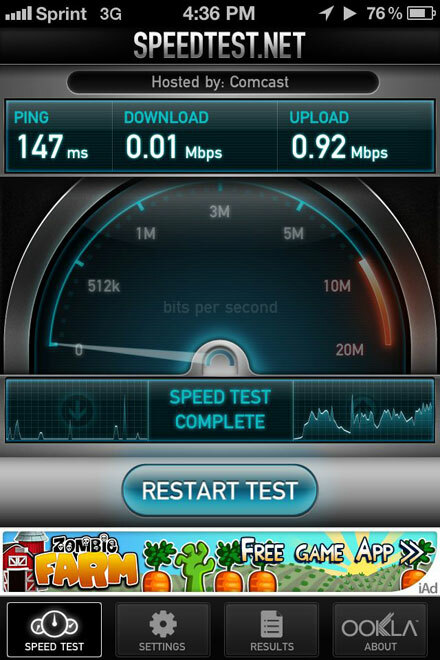 Unfortunately, iPhone 4S users on Sprint have been troubled with speed issues that we saw evidence of early on.Updated. Since the issue was initially discovered, threads have been popping up on the Sprint forums indicating that the issues are fairly widespread. Now it seems that an internal email has been sent to Sprint representatives, informing them that Apple and Sprint are working together on a “confirmed nationwide issue” dealing with the slow data rates many users are experiencing. There was no information about what the cause of the issues are or what the expected resolution date might be. The email did contain a reference to a ‘Service Settings’ update, which sounds like it could be referring to the carrier settings file that contains access point info for the carriers. Sprint customer Don Southard says that, after trudging through 6 different customer care representatives and calling on multiple days, he was read the email and was offered a free AirRave 3G Airvana hotspot as a ‘workaround’ for his data troubles. We have reached out to Apple and will update this story if we receive a reply. If the issue is nationwide then it is likely an issue with either the device itself or its baseband firmware. Hopefully Apple and Sprint can resolve this soon and Sprint owners can begin browsing on their iPhones at full speed. Update: Sprint has sent us the following and says that it is the only official statement regarding the status of the iPhone 4S on the Sprint network.